Ciro Ortiz, a sixth-grader from New York City, has found business success helping stressed-out New York subway-goers. For just $2, passerbyers in need of some advice or encouragement can stop and have a 5-minute consultation with him. And so far, the idea is a very profitable one! Ciro, who was a victim of bullying in the past, says he was sitting around watching TV one day when he came up with the idea to be a counselor – despite his young age. He says he figured there were a lot of people like him that could use some help, so he decided to do something about it. He told his parents, “I think I’m wise enough to give good advice!” And they agreed to let him test out his idea. Because he’s young ang still in school, Ciro is only able to work for two hours every Sunday (usually 12noon to 2pm or 2pm to 4pm). 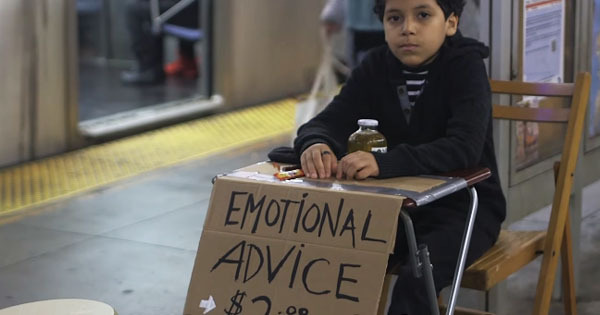 During these times, he goes to the Bedford L-train subway platform in Brooklyn, sets up his table and sign which reads “Emotional Advice For $2”, and he waits for people to approach. When they approach him, he listens to their problems regarding work, relationships, and other general issues in life. On average, he makes about $50 a week – quite a bit of money for an 11-year old. Now, his clients include men, women, and even police officers. Ciro is not greedy. He strongly believes in helping the community, and so he donates all his profits to helping kids at his school who can’t afford to buy snacks or lunch. He says his friends don’t quite get it, and that they don’t really understand what he’s doing or why. “But that’s ok,” he says. What a huge inspiration he is for all entrepreneurs – both young and old alike!